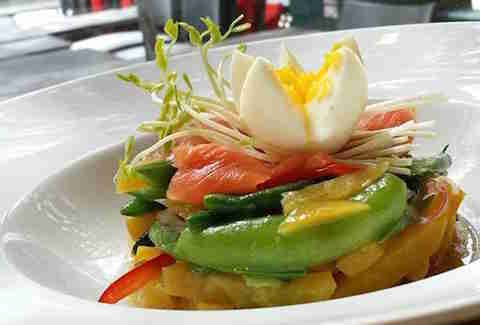 Pamika Brasserie Thai probably serves up the most authentically Thai dishes in the city. What the location lacks in space (the restaurant is tiny and also includes an equally small terrace) it makes up for in flavor, which comes from a small, open-concept kitchen. Groups can also request to have a Thai barbecue when making their reservation -- it includes a tabletop BBQ with homemade broth, marinated meats, shrimp, noodles, homemade Thai sauces, and an assortment of veggies. Proving that mock meats and fish can be delicious, ChuChai has been revolutionizing the vegetarian game with its clever and downright delicious Thai menu. Chef Lily Sirikittikul goes all mad scientist when she enters her kitchen and turns soy protein and wheat gluten into calamari. But, her most impressive magical creation is transforming soy skin into "fish" with seaweed acting as its skin. Coming to us also from the Sirikittikul family is Chao Phraya. The fine-dining restaurant has been filling Montrealers’ bellies with tasty Thai dishes since 1988. Start the meal with a filet mignon Thai salad with chili, onions, and mint and end your dining experience with a juicy mango accompanied by coconut-flavored sticky rice. 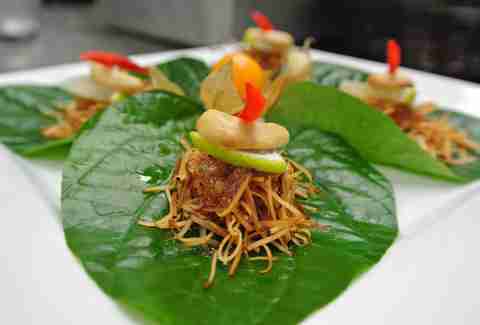 Located in a residential area, Galanga Bistro Thai is a hidden surprise that always leaves its customers satisfied. The Thai menu, which contains frequent appearances by the restaurant’s namesake ingredient, can be considered quite spicy for those with an aversion to heat. Tip: when ordering the roasted duck in spicy red curry and coconut milk with basil, don’t be afraid to ask for a mild version. These people mean business when it comes to heat. 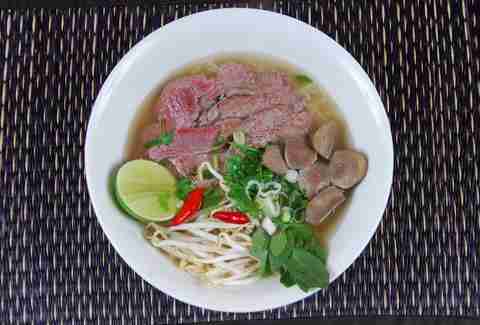 Searching for a Thai restaurant that doesn’t compound its menu with flavors from other Asian cuisines can be difficult to locate in this city. Phayathai utilizes only Thai cuisine with recipes and techniques literally taught to the restaurant’s chefs by their mothers and aunts, giving the menu that homemade, warm-fuzzy feeling. Popular dishes like the pad Thai have attracted such celebs as singer Kiesza and tennis player Milos Raonic. Surrounded by a pizzeria, a couple of sushi restaurants, a hot dog joint, and pastry shops, Ban Lao-Thai somehow manages to stand out of the crowd without really needing to try. The restaurant’s ability to beautifully marry Laotian and Thai cuisine pretty much explains it -- on a cold day, the seafood tom yum is unbeatable. One of Montreal’s most beautifully decorated Thai restaurants, Pick Thai’s menu includes authentic Thai flavor profiles that will transport patrons’ taste buds to the Southeast Asian country. Under the watchful eyes of golden Thai statues, diners feast on point-perfect dishes like panang chicken, mango salad, and chicken satay. Blending Thai and Cambodian cuisines, family-owned Tuk Tuk brings its customers on a flavorful journey with dishes like the chicken amok: a coconut milk-based dish with a spicy kroeung paste. 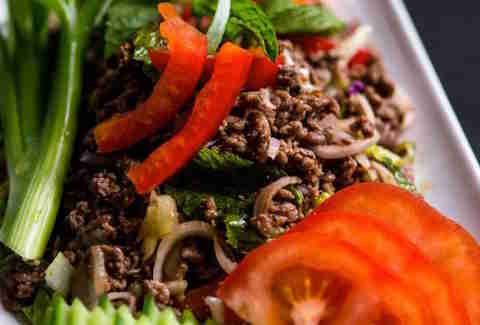 A must Tuk Tuk appetizer is the larb, a chicken or beef salad of sorts, seasoned with carrots, mint, basil, lime juice, shallots, and chili peppers to give it that kick. Looking at Restaurant Thaïlande from the outside may leave some underwhelmed, but venture inside and you will not be disappointed. Thaïlande is known for serving up great Thai food, like Kaeng Phed Talay: a red curry, coconut milk, and seafood dish served in a clay pot to patrons seated on the floor, in the traditional style. When we think of authentic Thai cuisine, “the food courts” is rarely the first place your mind goes to. So who would think that a little piece of Thailand could be found in a food court, served on Styrofoam plates? 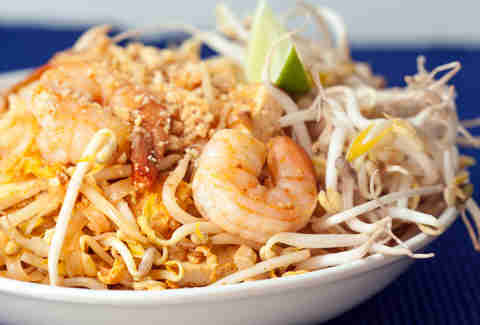 Well, go to Cuisine Bangkok and try the pad Thai. And do not ignore the warning sign below the menu board which reads, “We are not responsible for the level of spice you have ordered.” Even if you think you can handle spice, it still isn’t recommended to go hotter than a medium. You’ve been warned. Do you like coconut milk, curry, and seafood accompanied by an array of spices? 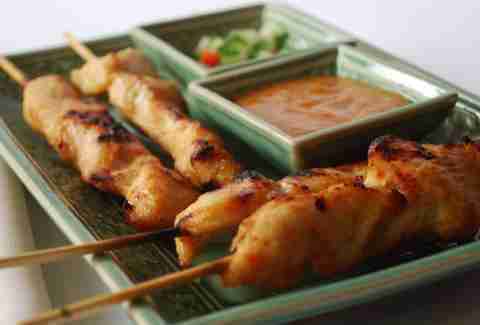 Then Talay Thai is the restaurant for you. 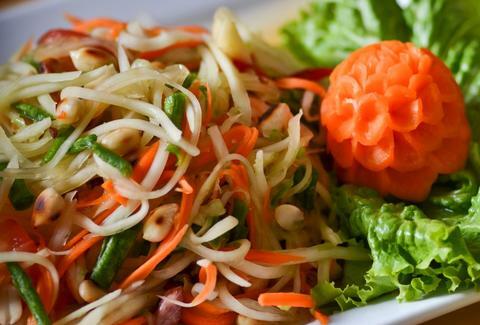 Start your meal with a refreshing green mango salad, followed by the pad prik king. And if you’re somehow still hungry, opt for the kluay tod: deep-fried bananas drizzled with honey. Felicia Di Palma is a Montreal writer who is disappointed more Thai places aren’t open for breakfast. Seriously, what’s with that? !